This is my entry in the ninth installment of the Monthly Wine Writing Challenge (short MWWC) competition. You can find more information about the challenge here (I am just now realizing its About page needs a bio badly!). Last month’s winner, Jeff aka The Drunken Cyclist gave us the topic “fear”. Fear is an all too common emotion associated with wine. Sometimes it marks itself as a certain uneasiness when you feel like you have no clue what to look for. Sometimes it is the horror of staring at row after row after row of wines in a wine store. Sometimes it shows itself in frustration when you look at a wine label and wish you understood what these things meant, and then you just give up. Sometimes it is this terrifying feeling of being invited to a wine party and you wonder what to bring…the list is endless. A wine culture and culture of wine writing that clouds itself in mystery in order to be needed to “enlighten” the few and the many has done its part in keeping this fear alive. 1) YOU are what matters when it comes to wine. Wine is a tasting experience, and we all have different taste buds, different likes and not so much likes, preferences and bring certain experience to the table. Don’t let anyone tell you what you have to like or what you should avoid. After all, what does a 100 point rated wine do for you if you don’t like it? 2) If something is normal, fear usually subsides. So take this: Wine is just a drink. Some might disagree, and while there is definitely an art and craft going into it, what it boils down to is that it is a drink. Just like beer or cocktails. 3) For me, wine is also a grocery, a staple food (in German we have this great term for staple foods and drinks: “Lebensmittel” aka “goods of/for life”). That means I incorporate wine into my daily (ok, perhaps not every day, but most day) routines. Making wine a normal part of your life makes you feel easier around it. 5) How do you know what your favorite beer is? How do you know what your favorite cocktail is? You must try different drinks to find that out. Take the grapes as the starting base because they are, after all, the key ingredient in wine. Seek out new grapes that you have not heard of before. 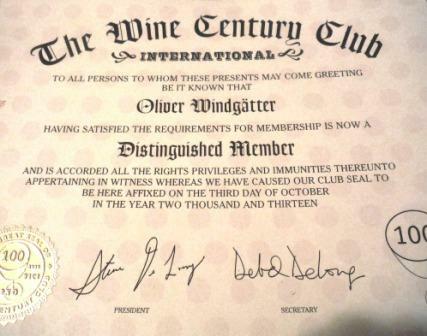 The Wine Century Club, which provides lists of different grape varieties, might be a good helper in that regard. 6) Not being alone is a good way to overcome fear (we remember that from early childhood, right?). Ask around, there might be friends that are interested in trying wines with you. Or sharing their experiences with wine. Wine is a social drink, and it is best appreciated with others. 7) Knowledge is a great way of overcoming fear. I don’t want to force anyone to read wine books (although I love them, with a glass of wine by my side), but why not talk about what you experience when you try a wine. If you have no one to talk to (I feel for you! ), take some notes: What do you like about the wine? Is it the flavors? Is it how it feels in your mouth? Does it smell good? Is it sweet or dry? Do you like how it tastes after you swallowed it? This way you will build a sort of database that helps you remember what you liked. From that base, you will soon find out what types of wines you like: drier or sweeter, younger or older, fruitier or dirtier. You work out a matrix of what works for you and you might find that you are expanding from it over time. 8) When fear is too strong, find allies. I was just at a huge wine store in Eastern New York state the other day. The selection was overwhelming. So I went and asked one of the salespeople to show me some wines I was looking for. They steered me into a wine direction, and the talk was fun and educating. They knew a lot about the wines (which is how it should be, they make a living from it! ), so I gained a lot from talking with them. Don’t be afraid to seek help. While it is a plus if you have an idea if you like fruity wines or dry wines, a good salesperson in a wine store will help you find something for you. 9) When fear kicks in, trick it. There is an easy to remember rule of thumb when it comes to picking a wine in a wine store and you don’t want help or help is not available: The lower the alcohol level, the sweeter the wine. An alcohol level under 10% ABV usually tastes sweet, between 10% and 11.5% somewhere in the middle, and over 12% is usually a dry tasting. This sets the base line for whether you will like the wine or not. 10) Be adventurous! It is all too easy to go back to a wine you liked, and often that will be just what you need and that is fine. But I strongly encourage you to take wine as a vehicle to get to know the world. I am a traveler at heart, and those many days that I cannot be on the road, I can let a wine bring a distant region or an exotic grape into my day. It makes for awesome stay at home travel. What exactly is ice wine and why is it so expensive? I published this post in May of 2012, but since as of late a) a friend of mine found it while she was researching Eiswein, b) this was an early post so chances are many of you have not seen this, and c) it was -20 degrees Celsius (-5 degrees F) last night up here in Alaska, I thought it was a good time to republish this post. I hope winter is treating you all well! There is a magic aura that surrounds German ice wine (“Eiswein” in German), especially the Rieslings. It is rare, it is expensive, and to me, it is more syrup than wine. German ice wine can only be harvested when it is -7 degrees Celsius (19 degrees F). This often only happens in December or January, which means the winemakers have to leave the grapes on for way after the usual harvest. If it does not get that cold, then the grapes will be lost, same is true if birds feed on them, which is why most now put some sort of net or plastic around the vines that carry the grapes. Other countries have resorted to collecting unfrozen grapes and then freezing them to produce ice wine. It takes away from that whole magic, and the grapes are not as weathered as they are in German ice wine. Grapes protected by plastic in Karl Erbes vinyards. Ice wines age incredibly well, and are good for decades, sometimes centuries. In their first years, they are almost overbearingly intense: the sweetness of the sugar, raging acidity on your tongue, it can be mindblowing. With age, they mellow out more, and that is when their true beauty shines. I can never drink more than a small glass in one go, but I think that is a good thing. Ice Wine is meant to be shared, and enjoyed at very special occasions, because they are very special indeed. Update 12/12/2012: Check out the video of an ice wine harvest here! Finally a Wine Century Club member! Some of you might remember that Nina and I actively pursued membership in the Wine Century Club over the last year. In March this year, the wonderful 2007 Pirita finally brought me over the threshold of having had wines made from 100 different grapes, and shortly thereafter, Nina took the hurdle as well. 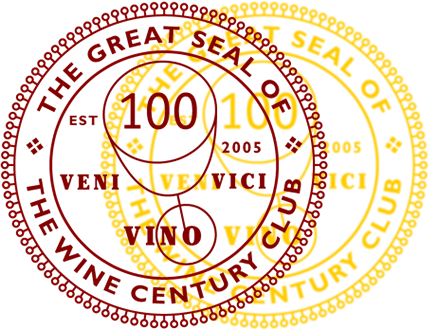 Just a short explainer: The Wine Century Club is an honors-system based club. The sole goal of the club is to encourage people to think outside of the box when buying or ordering wine. The “century” in the name refers to 100. You can only become a member, once you have tried 100 different grape varieties in wine. Membership is free and all it takes is mailing in a form (which you can find here), on which you tick off the grapes you have had. It is optional to provide the names of the wines you had the grapes in. It took us a while to get our act together, but on June 19, 2013 did we finally send in our spreadsheets, filled with the grapes that we have consumed…and remembered. Then started a waiting period. There was no acknowledgement of receipt, and we had no idea how long it would take. I knew other friends who had also submitted their application and had not heard back by early October…I decided not to worry and wait and see. After all, the Wine Century Club is a hobby for those running it, and sometimes life just gets in the way of things. And the wait paid off: Our membership certificates arrived, and oh man am I excited! I didn’t imagine that I would get this excited, but I definitely am. They even got the Umlaut (the two dots over my last name) right!!! The accompanying letter states that there are somewhere over 1,300 members worldwide. If they had as much fun as Nina and I did getting there, then there are 1,300 really happy folks out there! Last week, Anatoli received his Quatro Membership certificate (for 400 grape varieties tried), so it seems like they are working on the stash of applications (and Julian and Stefano received theirs as well). But naturally, Anatoli is inspiring us to aim at least for the double membership as soon as we can! Why don’t you get into the game and try joining the club with us? As an aside: I plan on writing from Germany as well, so there should be no significant lapses in blogging as you have seen all through October. Talk to you from the other side of the Atlantic soon!